from Friday, October3rd of the year2008. many duplicates of some of the tracks. Then, in a moment of what I call the Manic Fugue Amazon.Com Period (2003-2005), I bought many many more Stravinsky recordings in the mail, and imported those a million different times, and so now, I have what is usually known as an Asston of Stravinsky. EMO: Any other things I missed, or advice for rehearsals/performance? NM: In terms of general advice, I don’t have much! It sort of plays itself, this piece. There are a few moments that I always like to have MILKED OUT, namely, those glissandi in the cellos around figure N, which gets joined with the trombones ““ very sad, those moments! NM: Actually there are two things I always want to hear more of. You know the bass drum rimshot stuff in that section with the piano drones? I always want that to be like nine times as loud, like, dumb high school kids trying to do Peking Opera. The second thing is if your piccolo player can do a lot of vibrato in that whole fake gamelan bit (which I think I ask for but never explain that I mean almost out of tune!) we will be in good shape. 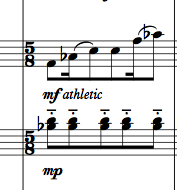 EMO: The violins and violas would love to know what you mean when you mark a passage “athletic.” They love poetic markings from composers, but this one is a bit mysterious. NM: Now, as for athletic, all I mean by that is energetic but controlled; steady, studied. Think about the way ostinati need to feel in Shostakovich (like somebody who has never run in his life outrunning the KGB or whatever – frenzied) versus how they want to feel in Reich, which is almost like rowers or a team of dogs. That’s athletic. And come on, that’s not TOO poetic! EMO: hmm “” athletic. It came off to me as meaning virtuosic or something. The music doesn’t imply that anyone is running from the KGB! It seems like much of the passagework in the piece is “athletic” in the sense you mention, so it’s a bit confusing when a few particular passages are marked that way. I guess you mean it as a “safety” marking in those particular passages with the violins and violas. NM: Yeah, that’s totally it. I mean it can get out of control. I use Britten as the model usually. This issue of marking scores is a big one. Sometimes, when dealing with musicians, what you want to do is give indications such that there is no possible question. Restrict it to “loud” and “soft,” that kind of thing. Other times, in order to tease out different effects, you can write out little notes. mf (mezzo-forte) but heavy. Smooth. Marked. Sometimes I like to get more frisky with them, and write use words like athletic, and then, as I have just learned, I end up confusing them. I sort of don’t mind too much; there’s nothing bad that can come out of a word like athletic, inasmuch as it’s not a particularly loaded word. Ideally, the word “solo” implies that the part is going to be very exposed, so you (the player) should bring it. In music like mine ““ without clear-cut melodic material ““Â a lot of times, patterns are the foreground. Patterns look like background on the page, so, you sometimes need to put a little note marking something as “to the fore” or “solo” just so people know that everybody is going to be listening to their li’l oboe twittering between two notes. And then, molto vib. just means, with a lot of vibrato, and the interpretation of “a lot” is up to whoever is holding the piccolo. If it were my homegirl Alex, she would know exactly how to set it out, because for her, a lot means a lot, and also, she has experience with, like, les flÃ»tes d’Asie or whatever. EMO: At W I had the picc player use a really wide, slow vibrato. Not sure if it totally works, but we’ll see when we get in the hall for a dress rehearsal. The picc player asked if I we could send out a press release stating that this is not his normal vibrato, so I think we’re on the right track. So we’ll see the difference. In one model (Colorado), it was as if I were a Dead Composer, letting the dots on the page do all the talking. This deal in Canada is a much more holistic experience. The Ices were conducted by an old friend, James Gaffigan, who has conducted pieces by me before, and presumably knows how I like things. All of this is fascinating to me. Like I said: a good problem to have. i live in ontario and would love to see this piece performed… what are the dates in K-W? i was at your show in toronto and it was amazing! hopefully you return again soon. James Gaffigan is the bomb. He conducts old warhorses at the San Francisco Symphony and makes them sound like new. Glad to hear he’s a friend and advocate. Excellent problem to have. I look forward to the day when I can have an Asston of Muhly with which my iPod can astound me. Right now my iPod just kinda has you sleepin’ around with som3 VERY strange bedfellows. Fascinating to me too. I am always excited by composer-conductor conversations, and Edwin Outwater is one of my great-great-great-great-grandchildren, having conducted the Bach Society Orchestra at Harvard, which I founded in 1954.
oh no don’t be a dead composer! i love how specific that email is, as if you have seven more emails about the cellists hair and whether or not the violist is allowed to take a smoke break. Your music makees me wish I could play an instrument. Are we going to have “Nicoisms” like we have “Graingerisms”? Any chance one of these performances will find its way onto the website here? I love the way Britten’s Balinese-inspired stuff (Curlew River is so amazing! ), so I’m dying to hear what you do with it.